Whether you want to shed 10lbs or 200lbs, losing weight isn’t easy. Nothing worthwhile in life usually is though, right? If you’ve got lots of weight to lose, it can seem overwhelming. I mean, it’s one thing to have overindulged over the holidays and have 5lbs to lose. You know what caused your weight gain, and you know exactly what to do to lose it. It’s a whole different deal when you have 30, 40, 50lbs or more to lose. Those numbers can seem overwhelming. And it’s that overwhelm that often causes people to just try and ignore their weight, pretend like they don’t care, etc. But here’s the thing – you CAN lose the weight, and it doesn’t have to be as overwhelming as you think. Instead of thinking “I have 50lbs to lose, that is SO MUCH, I can’t do it…” you need to reframe your mindset. Rather than setting your goal to lose 50lbs, you’ll have much better results if you attack your weight loss challenge 10lbs at a time. Once you’ve reached that 10lb loss, you’ll be riding on a high. 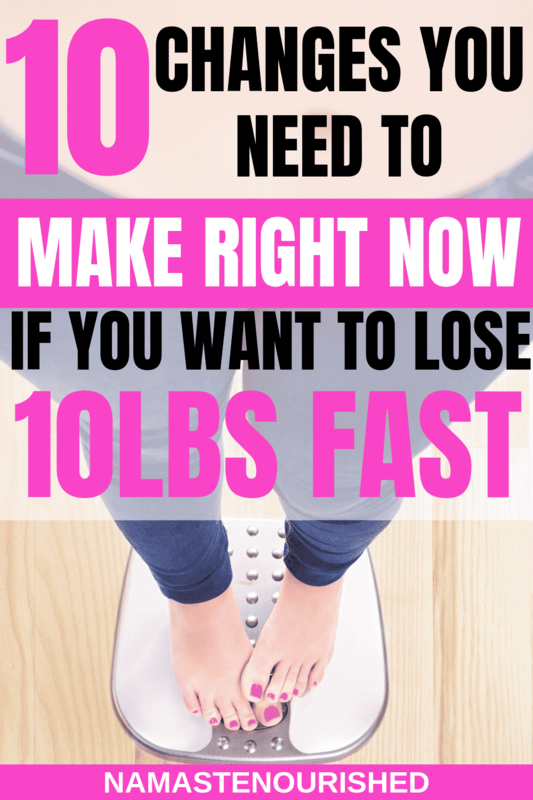 You’ll know what you need to do, and then and you can set another 10lb weight loss goal. To achieve your marathon goal, you need to break your action plan down into smaller chunks. So you might start by brisk walking every evening around your neighborhood. Then you start a Couch to 5k program, and so on. Definitely set your big, end goal. But then break it down into 10lb chunks. This is a manageable and easily achievable goal, and you’ll only need to make a couple of small changes to achieve it. Once you’ve reached it, set another goal to lose another 10 pounds, and then keep going until you’ve reached your weight goal. Losing bigger amounts of weight is going to require bigger lifestyle changes. However, in those initial stages, usually you’ll start to see some weight loss with even just a few small changes. NEED SOME EXTRA HELP TO LOSE WEIGHT? If things like soda, frappe’s and juice are a regular part of your diet, you might be surprised to learn that switching them out for water can go a long way towards reaching your goal weight. Switch out your high-calorie, high-sugar drinks for water and you’ll save hundreds of calories per day. If you’re not a fan of water, try flavoring it with fresh fruit using an infusion water bottle. Check out my favorite infusion water bottle here. The human body isn’t designed to sit down all day, or be confined a tiny cubicle – we need to be moving, staying active, using our muscles. Unfortunately for many of us, sitting down for 8 hours or more every day is the reality we face at our jobs. The fact that so many of us have desk jobs makes it all the more important to stay active outside of work hours. Of course, structured intentional exercise is recommended, but walking is a great way to stay active and to ease into exercise. Even if you have a regular workout routine, you should still be trying to get in at least 10,000 steps every day. Eating too fast frequently leads to overeating. When you’re not paying attention to what you’re eating, not chewing it thoroughly, watching TV or playing on your phone while you eat, you’re less likely to recognize the cues your body is giving you that it’s full. Give your meal your undivided attention, be mindful, eat slowly, chew your food thoroughly and you’ll eat less and consume fewer calories. Reducing your intake of processed foods and replacing them with whole foods will help you shed pounds fast. For example, instead of buying a frozen pizza for dinner, make your own healthier pizza using a whole grain tortilla, some tomato paste, spinach, kalamata olives, shredded skinless chicken breast, a sprinkling of feta cheese and a sprinkling of grated mozzarella cheese. Study after study has shown that a lack of sleep leads to weight gain and various other health problems. The body has a hormone called leptin which suppresses the appetite and is the hormone responsible for energy expenditure. A lack of sleep reduces leptin in the body which is a major cause of weight gain. The average, healthy adult should be aiming for 7-9 hours of quality sleep per night. If you feel like you’re constantly waking up tired or spending your nights tossing and turning, I recommend getting a sleep tracker to monitor your sleep, and then taking steps to towards improving your quality of sleep. You can check the prices and reviews of sleep trackers here. It’s not impossible to eat healthy when you’re dining out, but it can definitely be challenging. Not only do many popular restaurants have very little healthy options, it’s so easy to be tempted by all the fattening, high-calories foods on the menu. The average American, Chinese and Italian restaurant meals contain a whopping 1500 calories, and that doesn’t include drinks, appetizers and dessert. If your daily calorie goal is 1500 kcal, then one restaurant meal with a drink has already put you over the limit. If you need ideas for healthy meals to cook at home, I recommend checking out $5 meal plan. For just $5 a month, you’ll be sent weekly, healthy meal plans that the whole family will enjoy. Check out $5 meal plan here. It’s important to practice mindfulness in all aspects of our lives, but particularly when it comes to eating. The simple of act of being mindful of what we’re putting in our mouths can go a long way towards shedding pounds. Is this going to nourish me? Does it provide essential vitamins and nutrients that my body needs? How will it make me feel after I’ve eaten it? Am I eating it for the right reasons? There’s no such thing as a “quick fix” when it comes to losing weight, but the closest thing would be simple – eat more veggies. U.S. dietary guidelines recommend that we eat 2 1/2 cups of vegetables every day (and unfortunately, the potato in a french fry doesn’t count.) The average adult eats less than half the recommended daily intake of vegetables. Try to include vegetables in every meal, including breakfast. You’ve heard it before, but I’ll say it again – breakfast is the most important meal of the day. Studies have shown that people who eat breakfast are less likely to overeat during the day, and eating breakfast helps to kickstart your metabolism after your overnight fast. Make sure to always start your day with a healthy, nutritious breakfast!